In the last few years, online fitness and nutrition coaching has exploded. Many personal trainers are offering some form of “online coaching” service to meet the demand, and the personal trainers who aren’t offering it, typically want to. It makes sense. Online coaching allows you to work with more clients without having to physically be in a gym or travel to a client’s location. It's a great business model that allows you to leverage their time and help more people. No more trading your time for dollars. You can finally scale your business. The benefits for YOU, the coach, are obvious, but what about the benefits for your online clients? Are they going to get the results they desire by working with an online coach instead of hiring a personal trainer at their local gym? Yes, absolutely. And in many cases, their results will be even better. You know that each client has different needs and things that they struggle with. Yes, some clients need help executing proper form, which can be done through online coaching, but that's rarely the main thing holding them back from achieve true body and life transformation. In reality, most clients need two things: They need to be pushed out of their comfort zone and they need help maintaining consistency with their workouts and food choices. Online coaching can be very beneficial for clients who need the guidance and support of a professional. They need strategies for exercising and nutrition, and they need help taking action on that guidance. You can easily deliver this service online. It could come in the form of a workout plan and nutrition program completely laid out for them. You might have a monthly video coaching call with them, so that they can ask questions and share their progress with you. There are many ways to make this coaching happen. Even better, this can save your clients plenty of time because they simply follow the plans you outline, and it provides ultimate flexibility because they can follow those plans according to their schedule, not yours. So are you ready to launch your online personal training business? 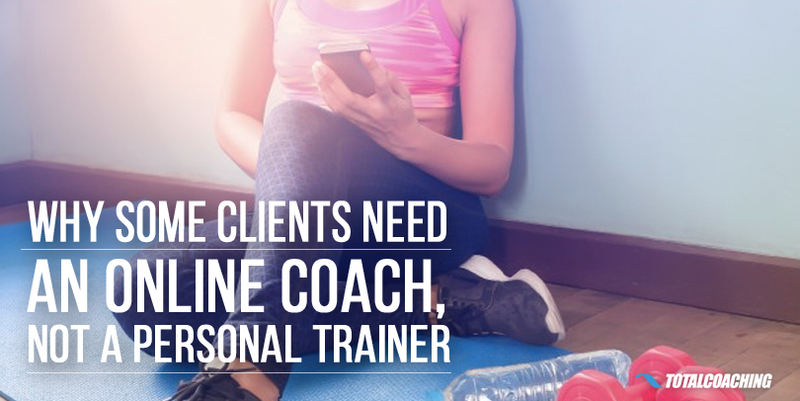 Well, when you're first pitching the service to prospective clients, you're likely to be met with the question, "Why wouldn't I just hire a personal trainer?" To get you prepared to answer, here are three reason why some people may actually need an online coach, not a personal trainer. 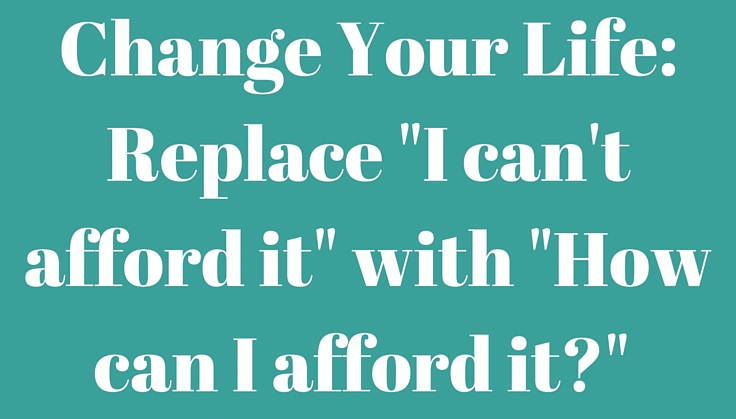 This is probably the most common reason that people benefit from having an online coach. Even clients who work with personal trainers often need some form of accountability away from the in the gym. Think about it: Most people who work with a PT will do 2-3 sessions per week. That leaves 5 days that they are on their own to make decisions about their food and complete other workouts. There's just too much time between training sessions for bad habits to creep in. A major benefit of working with an online coach is having daily or weekly check-ins that will help clients stay on-track during the week. This can be done via email, phone, text, or even a Facebook group. Private Facebook accountability groups are growing in popularity amongst fitness professionals because they create a sense of community even if the group members are physically located all over the map. People may complete workouts on their own, but they no longer have to be "alone" on their fitness journey. Being in a group of like-minded individuals that all have similar values and motivate each other to stay on track is a very powerful advantage of working with some online coaches that can solve clients' "accountability" issues. Personal training is not a cheap service. Depending on what city you’re in, you may be charging anywhere from $45-150 per session. This typically equates to around $800 per month or more based on the number of sessions a client buys per week. Have you ever had a prospect balk at your prices? Has anyone ever said that they'd love to work with you, but can't afford it? If so, online coaching might be the answer. Online coaching is an amazing opportunity for clients to work with you at a fraction of the in-person price. They can follow the exact same workout or nutrition plan as they would if they saw you in the gym, but since they do not need to physically be there with you for the workouts the service is often much more affordable. Online coaching prices typically vary per coach depending on what’s included in the coaching package, but your clients can expect to pay anywhere from $100-$500 per month. They get more service and pay a lower price. It's a win-win. This is not to be confused with an online program or product in which there is no access to the coach who created the program. Those do-it-yourself programs serve a purpose, but they are quite different from real coaching. Coaching is very personal and there is often plenty of feedback the client provides the coach to make proper adjustments throughout the course of the program. There are plenty of fitness programs sold online at a much lower price point because there is no “coaching” being done. Traveling and hectic schedules are two things that frequently disrupt in-person training routines. You've surely worked with a client who travel each month or simply doesn't make time to show up for all of your scheduled sessions, right? These busy clients are not likely going to get the results they way, which reflects poorly on you, even though it's not really your fault. So, why not let online coaching solve this problem? In an online coaching relationship, there is never reason why you can't "see" your clients each week. No matter how busy they are or how far away they've travelled, a quick video chat is often all they need to re-up their motivation and to re-commit to the plans you've laid out. Compliance and consistency are the two variables that hold back most people from seeing results. They simply don't stick to the plan when left on their own to do it. With the right systems and/or schedules in place however, online coaching can solve this problem for good. In the end, your clients get better results, you look like a superstar coach, and your online business grows! Online coaching may not yet be as mainstream as personal training, but it’s growing in popularity and is an incredible alternative to in-person training. Technology improvements and social media proliferation has made it very easy for us to communicate on a daily basis with our clients. It also enables us to manage online clients "in scale," meaning that we can work with far more today than we could have 10 years ago. This is the future of fitness coaching, so if you're not on board, take note. It's quite simple to get started in online coaching and the rewards, for both you and your clients, makes the leap worth it. Have questions about how to start your online fitness business? Drop them in the comments section below. 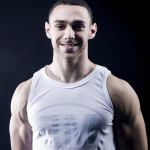 With over 6 years of coaching experience, working with everyone from doctors, executives, entrepreneurs, and corporate professionals, Jesse eliminates any guesswork with your fitness and nutrition using proven, time-efficient strategies. Results guaranteed.